I know you’re shocked – another hat. 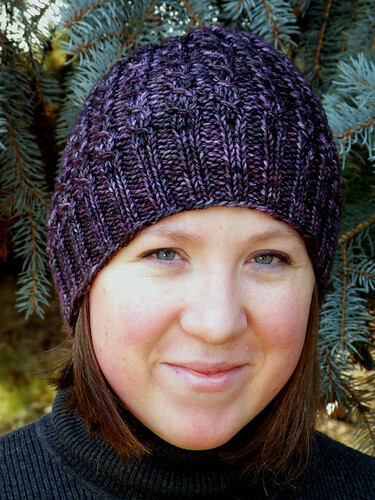 This is the Slouchy Copy Cat Hat, which is a super easy mock cable pattern that’s available for free. What’s not to love about that? The yarn is Have You Any Wool Luxe Sock in Famous for Nothing, which is super soft merino/cashmere/nylon blend. Way too pretty for socks. I held the yarn double, and the finished hat is one of my favorites. LOVE the color! This marks the last of my projects from 2009. It was a great year, both in my knitting and in my life! huge fan of that yarn. Looks like soft purply slighty-variegated wonderfulness. It’s actually greyish-black with pink. I think it’s a one off color she did, unfortunately. I love it and would make a whole sweater out of it if I could! Really, that is it??? That is ALL you knit in 2009??? Kidding you know! Lovely hat, lovely daughter! Pretty. I love the color! 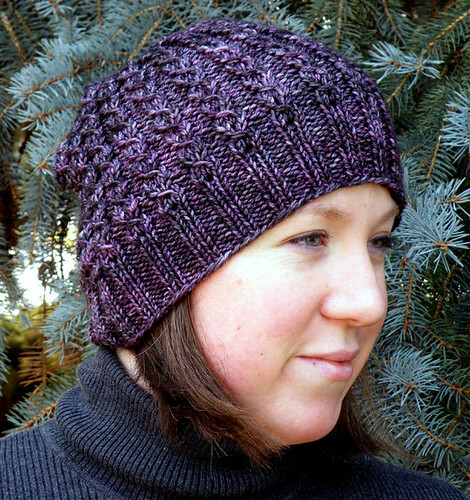 Pretty pattern in pretty purpley yarn, looks great on you.